HOODS is dealing with the phenomena of The Uncanny Valley – the human response of revulsion or uncanniness when faced with creatures, which are almost-human looking. Within this, an objective is to create a performance situation in which the boundaries between scenography, choreography, performers and audience disappear. Ingri Fiksdal is one of the most notable choreographers of Norway. Her work has toured extensively internationally in recent years to critical acclaim. HOODS will be traveling to various Nordic festivals in the coming autumn. Based on a score of intentions for choreography and music Moon, Sugar and Fur Attack 2 exists for the dream of symbiosis and is a sensorial abstraction of the four-dimensional human. The Mob is choreographer Emma-Cecilia Ajanki and choreographer/sound artist Julia Giertz. The Mob is recognized for setting their own agenda, moving fluently between formats and different expressions. Their creations have toured Europe, New Zealand and the United States. As well as being selected for Wilderness dance they are currently working on a new work through Europe Dance House Network’s Module Dance, to be premiered in October 2014. A reflection of community values. The lonely and distant villages of Danmark, Norway and Latvia as creators of the modern human identity. 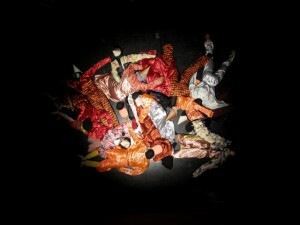 The performance is built on the basis of documented life stories of the local people – feelings and thoughts complemented by the creative team’s visual and emotional experiences. During Wilderness dance residencies The Swufus put themselves through the test of wilderness. They took a walk through the amazing wilderness places and now inspired by nature, they want to give a gift, to give the walk back. Take a Walk to Give it Back is a performative workshop and a sensory walk. It is based on dance improvisation practice, where participants will explore movement and body through the interaction among themselves and the environment. Four artists share a process in which they focus on the nature of dance. The relationship between the dancer’s body and movement to nature and the natural has altered through dance history. The choreographer-performers wish to take part in this continuum and dance the nature of 2014. An experiment with sensors, with soft and hardware developed by the artists, the audience is invited into a “created room” to explore. A room filled with soundscape from Denmark, Iceland and Norway, an installation inspired by Danish windmills, Icelandic vulcano energy and Norwegian wind and water. An invitation to a shared experience of the fragile self, a self that is gazing at its own gaze, staring at its own stare, perceiving its own perception, unsettled by its own borderlessness in the blue light of empathy. A piece about the familiar and the unknown. About people and something else that remains alongside humanity. Where does nature start and end? At the surface of our skin, or in a far away galaxy? And how do intelligent systems described in biology connect with ideas of intergalactic collectives? And what about us? LIFE IN THE UNIVERSE – a gathering for animals, people and minerals deals with shifting paradigms of our relations to natural environments and possible roles for humans.